Domaine de Papolle was established in Gascony in the 17th century and is spread over 135 hectares, including 55 hectares of vineyards. Gascony is best known as the home of Foie Gras, d'Artagnon and Armagnac. The Romans introduced the vine, the Arabs the alembic still, and the Celts the wooden cask. These were brought together in to make brandy in Gascony as early as the 12th century. While it's northern cousin Cognac gets all the glory, I have always found Armagnac more compelling. It's the home of many small producers of great integrity rather than large corporations. Would you like to meet one such producer? 1) 15 Year 2) 20 Year 3) V.S.O.P 4) 1990 Vintage and 5) 1975 Vintage What's more, the tasting is complimentary with dinner in Stage Left. Class is at 8 PM.Have dinner before or after and enjoy the tasting. Mr. Piffard will take us through a 45 minute exploration of the region and guided tasting and will be available to answer all your questions. These brandy are stunning and this is an unprecedented opportunity. Seating is limited so please reserve. Reservations@StageLeft.com or 732-828-4444. Snow is white, but our truffles are black as coal. We're serving them in Catherine Lombardi over linguine with an Alfredo style sauce. 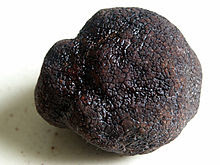 We are continuing our Black Truffle Menu in Stage Left Steak through the weekend. We will offer this menu so long as supplies last.